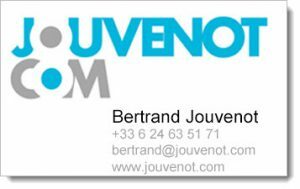 To contact me, the better is to send me an e-mail to this address: bertrand@jouvenot.com. This is a personal mail box I am the only one to access to. I will do my best to answer even if I can’t guarantee to do it immediately. Feel free to join me by phone at +33 (6) 24 63 51 71, too. Once again, it is a personal number you can use in confidence and I will try to call you back as soon as possible. A contact form is equally available.